Israeli couple weds in Uman, Ukraine, the first time that a wedding takes place at the tomb of Rebbe Nachman of Breslov. A wedding ceremony was held in Uman, Ukraine, on Sunday, just in time for the Jewish New Year. The ceremony marked the first time that a Jewish couple wed at the tomb of Rebbe Nachman of Breslov during the annual pilgrimage that takes place on Rosh Hashanah. 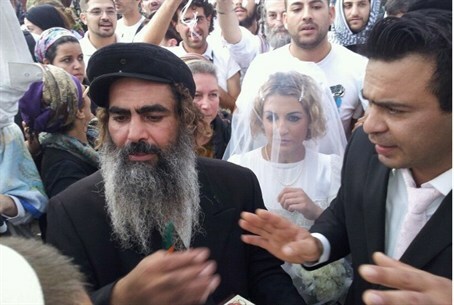 The Israeli couple was married by Rabbi Shalom Sabag, who arranged the marriage ceremony. The wedding was attended by a large crowd of people who were taking part in the annual pilgrimage. Photos by Shmuel Ben-Yishai, Hadashot 24 news agency.